I really want a cookie. 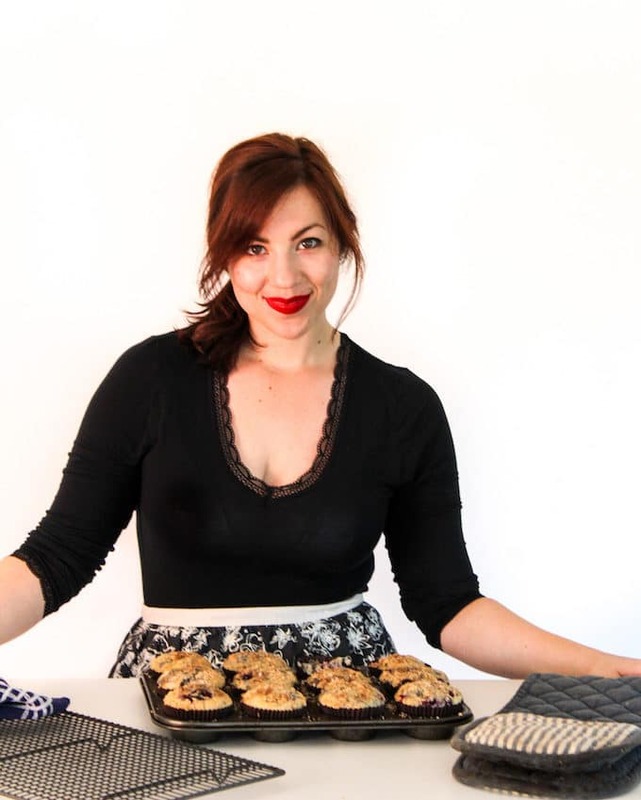 Actually – more than anything I think I really just want to bake something! No wait….I definitely want a cookie. I keep thinking about making these Sunflower Seed Chocolate Chip Cookies and then having to talk myself out of it. Despite the whole really-want-a-damn-cookie thing I’m actually really enjoying this Whole30 challenge so far. I probably won’t be singing this same tune this time next week, but I think it’s been forcing me to be more creative with my food. Instead of eating egg on toast for dinner everyday like I normally do I’ve been putting in more of an effort to try new things and so far it’s all been delicious. More on those later. 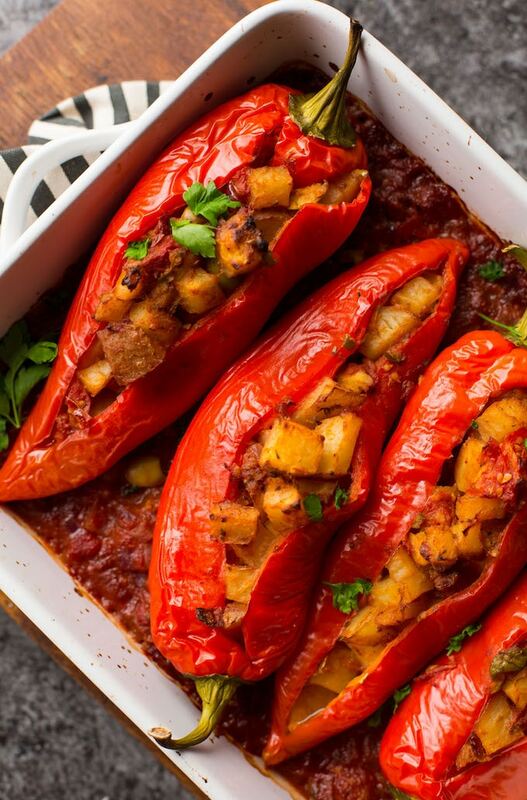 Speaking of new meals, how about some Potato and Olive Stuffed Banana Peppers, eh? Not only is this a Whole30 compliant dinner but it’s vegan to boot! I find that most Whole30 meals rely quite a bit on meat as the main staple. Personally, that just not how I like to eat most the time so I’m really excited about finding/sharing more plant/veggie focused meals. Despite the long list of ingredients these are actually made up of only 10 ingredients (plus salt & water but I don’t think those really count). 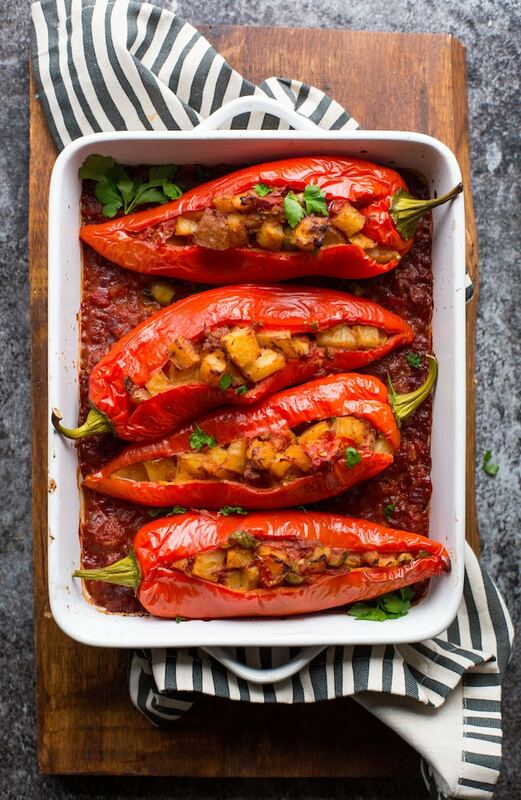 These stuffed peppers are made up of two parts: the sauce and the stuffing and both of those rely mostly on the repeat ingredients. First things first: the sauce. It’s very simple to make. Start out by sautéing your red onion for a few minutes before adding the balsamic vinegar and garlic for extra punch. Cook another minute before adding the remaining sauce ingredients and let simmer to deepen the flavour. Once the sauce beings to simmer you can start prepping peppers. To make the potato & olive stuffing – add the filling ingredients to a hot pan and cook for about 10 minutes to lightly brown and soften. Add a little bit of the sauce you made earlier to coat and you’re ready for stuffing. Once the peppers are stuffed and laid out in sauce coated baking dish all you need to do is bake and wait. After about 40 minutes the potatoes and peppers should be fork tender and ready to go. 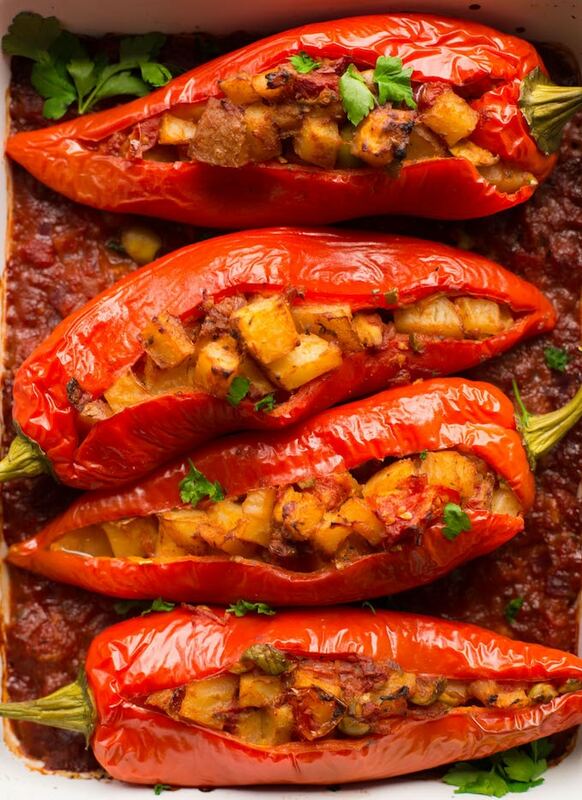 Don’t forget to #asaucykitchen on instagram if you try these Potato and Olive Stuffed Banana Peppers! I’d love to see what you make with it! You can also post your pictures to my facebook page! In a medium sized pot warm the olive oil on a medium heat. When the oil is hot add the onion and fry about 4 minutes to soften. Add the garlic and balsamic vinegar cook another minute until fragrant. Stir in the cumin, oregano, tomatoes and water. Reduce the heat down to a low heat and let gently simmer another 10 minutes, stirring every few minutes. Taste and season with salt if needed. While the tomato sauce is simmer begin prepping your banana peppers. Using a sharp knife, cut the peppers down lengthwise starting just below the stem and all the way down to just above the point. Carefully pull back the sides of the peppers and pull out and discard the white membrane and seeds inside. Set aside until you're ready to stuff. 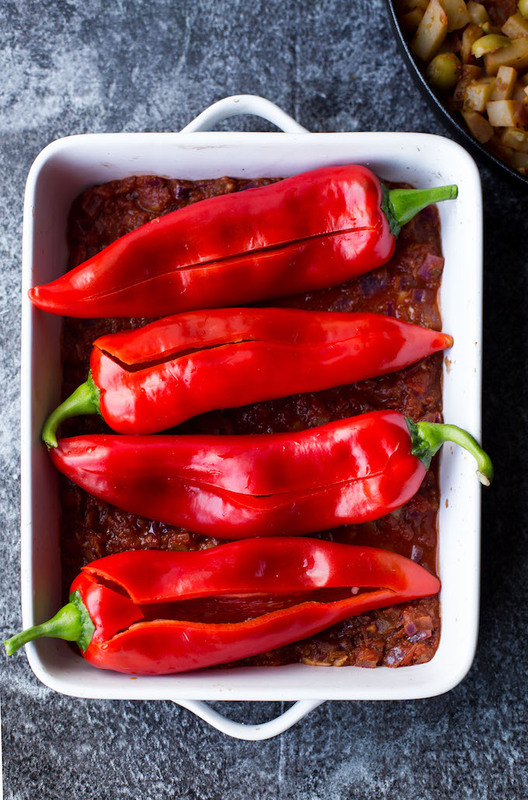 Preheat your oven to 350°F/175°C and lightly grease a large roasting dish large enough to fit your peppers. In a large skillet or frying pan warm your olive oil on a medium heat. When the oil is hot add the potatoes, garlic, cumin, oregano and peppers to the pan and cook for about 10 minutes or until the potatoes begin to brown. 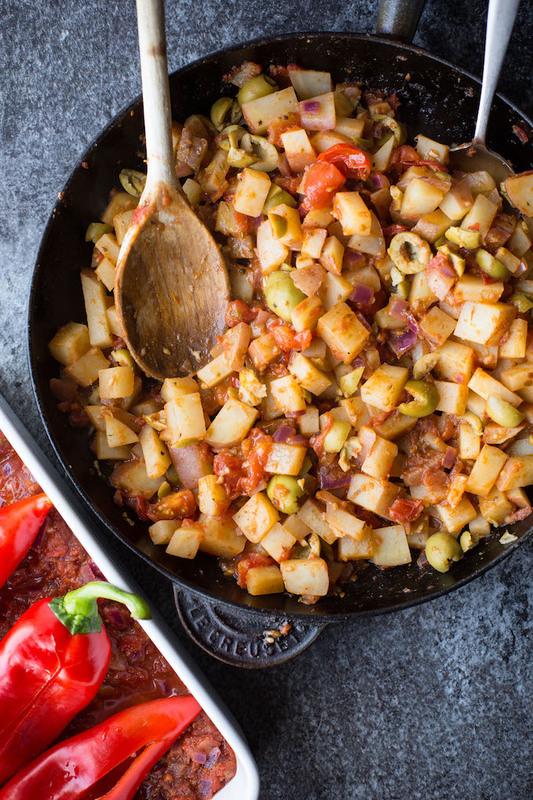 Add 1/2 cup of the tomato sauce you made earlier to the pan along with the olives and stir until all the potatoes are covered in sauce and the olives are mixed in well. Taste and season with salt as needed. Spread the remaining tomato sauce along the bottom of your prepared roasting dish. Place the peppers on top of the sauce. Carefully spoon the potato and olive mixture into the hollowed out peppers until full. Bake in the middle of the oven, uncovered for 40-45 minutes or until the potatoes and peppers are tender. If you can have dairy you can sprinkle a little mozzarella over the top of the peppers about 15 minutes before cook time is up. OMG these look incredible and sound as if they taste delicious! A zesty and hearty winter dish. Thank you for sharing! Love the addition of the salty olive with the earthy potatoes.